Although Indiana University is rolling out the new CrimsonCard this spring, IU School of Medicine ID cards will remain valid and continue to work until at least June 30, 2018. A detailed FAQ, including information about varying processes at each IU School of Medicine campus, is now available. Current IU School of Medicine students (undergraduate, graduate and professional), faculty and staff, including part-time and student workers, should disregard the timing indicated in the IU-wide promotion and wait until June 5, 2017, to secure a replacement card. Reminders and updates will be shared throughout the summer in INScope and via MedTV. Questions not addressed in the FAQ should be directed to Clinical Affairs IT Services at 317-274-5336 or CAITS@iu.edu. With several service enhancements over the past year, Clinical Affairs Information Technology Services (CAITS) continues its commitment to providing full-service technology support to the Indiana University health sciences community. CAITS provides several technology services for students, faculty and staff from IU School of Medicine, regardless of venue or geographic location. Some of their services include solving computer hardware and software issues, providing multimedia support for conference rooms and classrooms, and developing internet and intranet web applications. CAITS can provide support to complete IT activities for grants, research, clinical or administrative staff projects. It can also provide consultations with clients who need better IT solutions and can help ensure sustainability, reliability and scalability of an IT solution. In the past year, CAITS received and completed over 20,000 service requests--1,700 requests per month. Recently, CAITS completed several months of work preparing Windows 10 for deployment. While Windows 10 has been available to consumers for many months, CAITS configured it as a secure and reliable environment for health sciences clients, with several new security requirements and additional self-service software packages made available through Software Center. Starting in January, CAITS began deploying all new computers with Windows 10. CAITS plans to migrate 3,500+ existing laptops and desktop to Windows 10 in the near future. CAITS has five service lines--client services; application, web and business intelligence; system infrastructure; information security office; and statewide IT support. To learn more about these services, view this infographic. You can also find out more at caits.iu.edu. 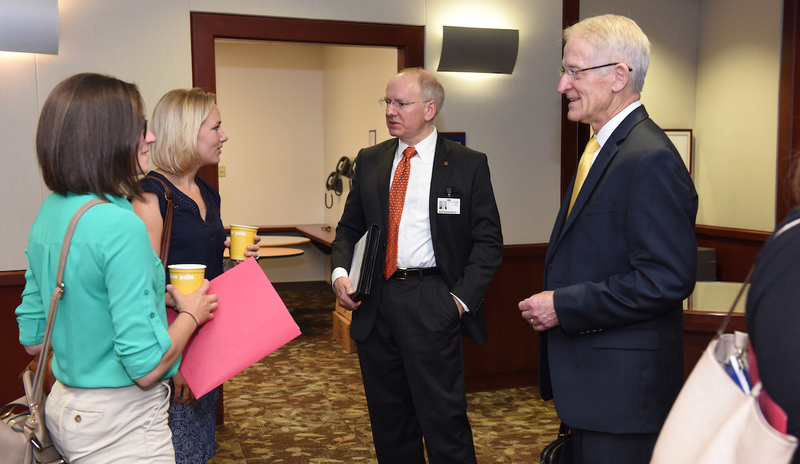 Just 30 days remain until Liaison Committee on Medical Education (LCME) site visitors arrive, giving IU School of Medicine the opportunity to demonstrate its many strengths across the nine-campus system. Weekly reaccreditation messages, which started hitting inboxes earlier this month, provide students, faculty and staff with information about the upcoming site visit and how the school has prepared for reaccreditation. Watch for the email updates on Tuesday each week leading up to the April 23-27 reaccreditation site visit. The Oncological Sciences Center at Purdue University's Discovery Park and Indiana University Melvin and Bren Simon Cancer Center have created a collaboration that utilizes the resources of each organization in an effort to develop a device to create a less invasive means of detecting prostate cancer. "This clearly opens up doors to resources we may have not known that we had," said Tim Masterson, MD, associate professor of urology at IU School of Medicine and a researcher at the IU Simon Cancer Center. "We do have basic scientists, but I think the areas of expertise with nanotechnology, chemistry and engineering open different avenues for us that we otherwise wouldn't have known were there. We can develop different approaches and identify new technologies to incorporate." The Walther Cancer Foundation provided funding for the two-year project. Brittani Bungart, an MD/PhD student at IU School of Medicine, is working at Purdue with Ji-Xin Cheng, a professor in biomedical engineering and chemistry. Cheng is a member of the Purdue Center for Cancer Research. "The great thing about this collaboration is we get input from the doctors early so we can change our design earlier in the process rather than making a tool and going to the surgeon and having that person say, 'No, this isn’t going to work,'" Bungart said. The IU Center for Global Health recently selected a new group of nine IU School of Medicine residents for its Interdisciplinary Global Health Residency Track. The track is a multi-specialty, co-curricular learning track for residents dedicated to improving the health of people worldwide. Track residents come from multiple specialties, including internal medicine, pediatrics, med-peds, OBGYN, general surgery, family medicine and psychiatry. During their residency, residents in the track have a global health mentor, complete a scholarly project in global health, attend extra didactics and complete an international rotation. Many residents chose to do their international experience in Kenya at IU's long-standing partner Moi University School of Medicine/AMPATH (Academic Model Providing Access to Healthcare). Others have been to China, Ghana, Ecuador, Honduras, India, Peru and Togo. The 26th annual Evening of the Arts, Saturday, April 8, is just two weeks away. The annual variety show performed by students, faculty and staff begins with dinner and a silent auction at 5 pm, followed by the variety show at 6 pm. The event, which benefits local nonprofit health clinics, will be held at Crispus Attucks High School in Indianapolis. Tickets for the dinner and show may be purchased at iusmeota.com. Student tickets are $8 ($10 at the door) and non-student tickets are $10 ($15 at the door). Questions? Email the Evening of the Arts Committee at iusmeota@gmail.com. For the study, a team of more than 40 scientists at institutions in the United States and South Korea was led by four senior authors including IU School of Medicine’s Maria B. Grant, MD, Marilyn Glick Professor of Ophthalmology and corresponding author; Mervin C. Yoder, MD, IU Distinguished Professor, Richard and Pauline Klingler Professor of Pediatrics, associate dean for entrepreneurial research at IU School of Medicine, director of the Herman B Wells Center for Pediatric Research and corresponding author; and Fletcher A. White, PhD, Vergil K. Stoelting Chair of Anesthesia, professor of anesthesia, pharmacology and toxicology. The study was initiated by Dr. Grant and her graduate student, Tatiana Salazar, in 2011, when they were working at the University of Florida with Huisheng Xie, DVM, PhD, a veterinary acupuncturist and another senior author on the paper. “This work is a classic example of the power of team science, where investigators in different institutions with specific expertise worked together to unravel the complexity of how electroacupuncture works to help the body respond to stressors,” said Dr. Yoder. For details on the study, read the full news release in the IU School of Medicine Newsroom. Faculty dossier materials for promotions effective July 1, 2018, are available online at Promotion and Tenure @ IUSM. Dossiers are due in the dean's office (Academic Administration) no later than June 30, 2017. Departments will have an earlier due date that should be available from the department chair or regional campus director’s office. Email Lynn Wakefield at lwakefie@iu.edu no later than June 1, 2017, to inform the dean’s office of your intent to submit a dossier for promotion. With questions about dossier preparation, contact Deb Cowley at dcowley@iu.edu. Sample dossiers are available. A more concise list of documents is available for department or regional campus administrators. Refer to the IU School of Medicine student handbook for the International Travel Policy and other school policies including guidelines on Immunizations. The handbook, which includes a wide variety of updated policies, is housed on the IU School of Medicine website. Michael E. Johnston, II, a fourth-year IU School of Medicine-Indianapolis student, received the U.S. Public Health Service’s Excellence in Public Service Award for his service to underserved communities. The Public Health Service, part of the U.S. Surgeon General’s Office, honors U.S. medical students who are involved in public health issues in their community and are committed to increasing awareness of the Public Health Service’s mission to protect, promote and advance the health and safety of American citizens. 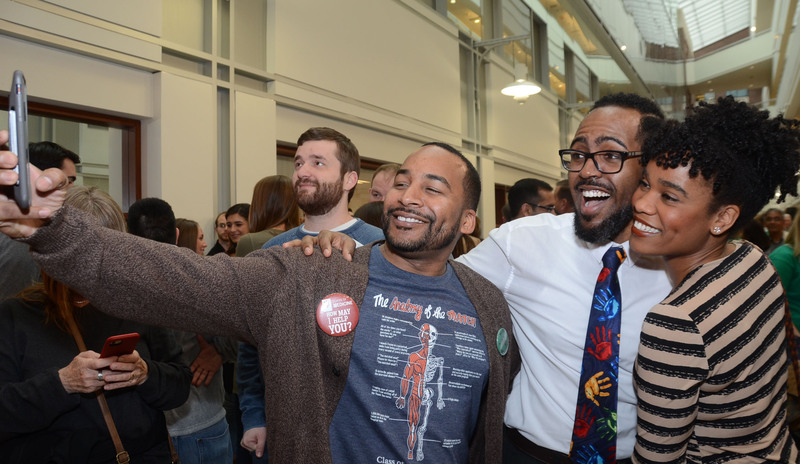 “In the midst of his outstanding academic, research, and leadership efforts, Michael additionally excelled within the area of providing service to local and global underserved communities,” wrote Antwione Haywood, PhD, assistant dean for medical student education, in his letter nominating Johnston for the award. In honor of Oral, Head and Neck Cancer Awareness Week, the IU School of Medicine Department of Otolaryngology-Head & Neck Surgery is offering free oral, head and neck cancer screenings [LINK TO PDF] from 1-5 pm, Wednesday, April 5, in the Ear, Nose & Throat Clinic (Suite 3170) at IU Health University Hospital. For course descriptions and to register, visit library.medicine.edu. American Cancer Society Institutional Research Grant (ACSIRG) funds are available for pilot projects to assist new investigators holding the rank of assistant professor, research assistant professor or assistant scientist. This grant provides support for beginning investigators to enable them to initiate their independent research program. Applicants must not have an active national competitive grant (i.e., NIH, NSF, ACS), regardless of the topic. The ACSIRG program’s purpose is to attract new investigators from Indiana University into cancer research and to provide support for new pilot studies that will produce preliminary data for the investigator to develop into studies that will compete successfully for external, national funds from both federal and private sources. Faculty from the IU School of Medicine and its regional campuses; and the schools of nursing, dentistry, optometry, public and environmental affairs, health and rehabilitation sciences, liberal arts, law, science and informatics are encouraged to apply. Details are available in the Request for Proposal. The deadline for completed applications is Monday, May 1. The Indiana Clinical and Translational Sciences Institute is accepting applications for pilot funding for research use of core facilities. The Indiana CTSI core pilot funding program promotes the use of technologies and expertise afforded by the CTSI core facilities available at all partner institutions. Applications--with letters of intent due Monday, April 3--will be evaluated on the quality of the proposed science, as well as each application’s strength in clarifying the plan for leveraging the award toward the achievement of CTR objectives. Funding for projects is limited to $75,000, and the duration is up to two years. Proposed projects should have at least two principal investigators/collaborators with equal contribution, from at least two of the five sponsoring affiliates for this program: IU School of Medicine, IUPUI (non-IU School of Medicine), IU Bloomington, Purdue University (West Lafayette) and the University of Notre Dame. Application details are available. Application deadline is Friday, May 5. The final beam was put in place Friday, March 17, during a topping off ceremony at the new IU School of Medicine-Evansville campus. Evansville Mayor Lloyd Winnecke said the project will transform the region. Read more 44News coverage. Plan to attend “Painful Hope: A Palestinian Activist and an Israeli Settler Rabbi Talk Peace,” a lecture to promote understanding, non-violence and transformation, from 1:30-2:30 pm, Tuesday, April 4, in the IUPUI Campus Center Theatre. For more information, visit friendsofroots.net.